Ah September. The hot days of summer are winding down, kids are going back to school, and most importantly here in the south (in my husband's opinion), college football season begins again. 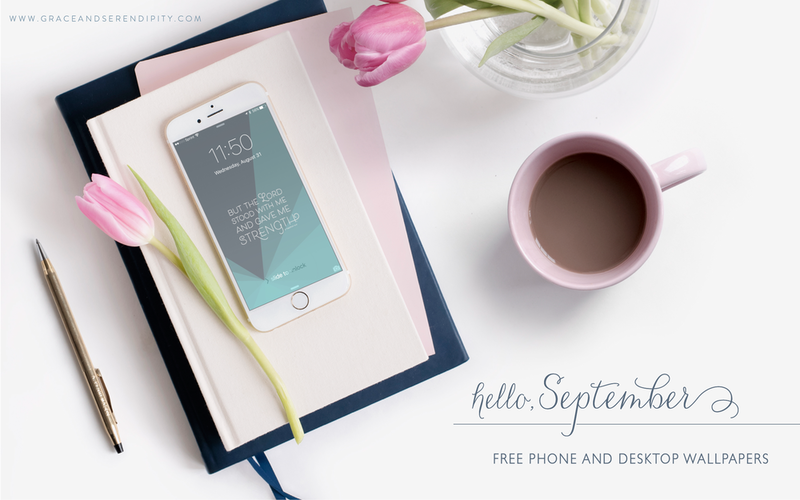 As always, there is one desktop design and two phone designs for this month. I am curious to see which one you will love more! I am also going to be changing things up here this month and am returning to blogging weekly on Thursdays and so every month, in addition to sharing the designs for the monthly downloads, included with it is going to be my thoughts behind why I added a particular verse for the bonus design. In the past, this was included in the monthly note of grace, but I want to open this up to everyone who visits my site as a way to learn more of my "why" behind what I do. So if you'd like, I would love for you to continue to read below to see why this months verse was chosen. "But the Lord stood by me and strengthened me, so that through me the message might be fully proclaimed and all the Gentiles might hear it." I feel that this verse can help so many people to overcome obstacles that they are encountering, whether they are big or small. On a personal note, I think this speaks volumes to what God wants us to do as Christians. For a very long time, I have quietly prayed and built a relationship with Him on my own, but I was afraid to talk about anything out loud. That is not what He wants. He wants us to have strength to speak about him into people's lives, to help others to grow a relationship with him too. Over the last few months, I have gone through a tremendous change in my soul and I am no longer afraid to talk about my relationship with Christ and how I want it to grow, to share verses from the bible that lift me up and stir my soul and encourage people to build a relationship with Him as well. I hope that this month's free calendar downloads will bring a smile to your face, help to keep your desktop clean and your calendar organized with dates at the ready, and that the bonus design encourages you, builds you up, and gives you strength. I would love to hear from you in the comments below what your thoughts are on this particular book in the bible too, if you'd like to share! Take care, and have an amazing month! Hi, I'm Kristin! I am a wedding invitation designer, creating loved collections for forever sweethearts that I hope will turn into heirloom pieces as the years go by. This blog houses wedding tips, current designs, inspirational ideas, and real weddings for you. Enjoy! B E S O C I A L ! © Grace and Serendipity 2018, All Rights Reserved.